Turkish Foreign Minister Ahmet Davutoglu’s threat to retaliate against anyone in Syria who dares to damage the tomb of Suleyman Shah, grandfather of Osman I, founder of the Ottoman Empire, is the latest manifestation of the Turkish government’s utter hypocrisy. Here is a country that has committed genocide against millions of its Christian subjects (Armenians, Assyrians and Greeks), confiscated their possessions, occupied their lands, destroyed thousands of churches, cemeteries and cultural monuments, and yet has the audacity to warn Syrians before any damage is done to an ancient Ottoman grave! While the tomb of every human being must be protected and treated with respect, Davutoglu’s threat is a flimsy excuse to interfere in internal Syrian affairs. Ironically, Suleyman Shah’s grave is located in an area not controlled by the Syrian government, but by al-Qaida Jihadists and other rebel groups who have been aided and armed by Turkey to topple Pres. Bashar al-Assad’s regime. The al-Qaida fighters, who have been clashing with other anti-Assad factions in the region where the Ottoman tomb is located, are the ones destroying graves, since radical Islamists believe that the veneration of tombs is idolatrous. Turkey considers the plot of land in Syria where Suleyman Shah’s grave is situated to be sovereign Turkish territory based on the 1921 Treaty of Ankara signed between Turkey and France, which was occupying Syria at that time. According to that agreement, Turkey had the right to station guards and hoist its flag at that site. Ever since 1921, two dozen Turkish soldiers have been guarding the tomb around the clock. Article 9 of the Ankara Treaty allocated to Turkey around 80,000 square feet of Syrian territory, 60 miles south of the Syrian-Turkish border. 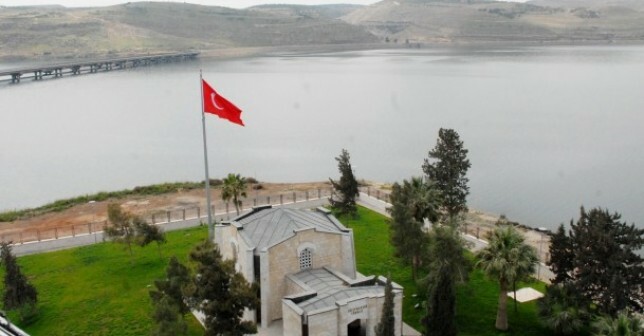 When the area around the tomb was flooded in 1974 by the newly-built Lake Assad, the grave was moved to a new location, 20 miles from the Turkish frontier. Despite the ongoing hostilities in Syria, Turkey has continued to maintain a contingent of its soldiers at the tomb. In return for giving Turkey territorial rights over this ancient site, France obtained several economic concessions, including the right to have French companies manage the railroad traffic in parts of Turkey and exploit iron, chrome and silver mines for the next 99 years. This questionable trade-off may not be legal under international law, since a colonial power is bartering with someone else’s territory! The 1921 Treaty also established "a special administrative regime” for Turks living in the district of Alexandretta, which was Syrian territory under the French mandate. In 1939, Alexandretta was completely severed from Syria and officially ceded to Turkey as the Hatay Province. After its independence from France in 1946, the Syrian government acknowledged Turkish sovereignty over the land where Suleyman Shah’s grave is located, but never accepted the give-away of Alexandretta to Turkey. In a press conference held in Van last Friday, Foreign Minister Davutoglu warned that any attack on the Ottoman-era tomb in Syria "from the [Syrian] regime, radical groups or anyone else would be subject to retaliation from Turkey. 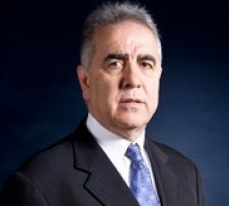 In defending its sovereign territory, Turkey will take all necessary measures without any hesitation…. At the present time, there is no question of any intrusion targeting our territory [the tomb in Syria] and our soldiers, but we stand ready to take whatever steps needed in the event of a threat. The Turkish public need have no doubt in this regard.” Meanwhile, officials from the Turkish Foreign Ministry, General Staff, and National Intelligence Organization (MIT) met on March 13 to discuss the security of the Shah’s grave. Although Davutoglu did not specify what measures Turkey would take, the Turkish media speculated that it might send additional troops to guard their revered site. In my view, Davutoglu’s threat is simply an exercise in saber-rattling against Syria in order to draw the Turkish public’s attention away from Prime Minister Recep Tayyip Erdogan’s recent scandalous and possibly criminal behavior, on the eve of the March 30 municipal elections in Turkey.